Kairos volunteers come from all walks and strata of life. They all share a desire to follow Christ's admonition of Matthew 25:36, "I was in prison and you visited me." If you feel God's call to minister to the incarcerated, to the female family member of someone incarcerated, or as a part of a Kairos team, contact the State Chairperson to inquire about how you can get involved, or contact the KPMI office to find out about qualification and training and to be put in touch with the local Kairos community. Not all team members serve inside correctional institutions. Kairos Outside weekends are usually held at church camps (and similar facilities). Each Kairos retreat weekend has opportunities for outside support, such as baking cookies, writing letters of support, or preparing meals. Get your church's Sunday school classes to color place mats for mealtime in prison. We may need up to 5,000 dozen cookies for a typical Kairos weekend. Do the math... that's 60,000 cookies! Homemade cookies are a tangible expression of Christian love and an indication of God's concern for a group of people who seldom encounter either in the course of their daily lives. Your loving sacrifice will provide "bread" that shines the Light of God's Grace into the darkest corners of a prison unit. May God bless you for the gift of baking! Different institutions have different rules concerning cookies, but if they allow cookies, you can guarantee that they'll allow chocolate chip! Check with your local Kairos community representative for details. 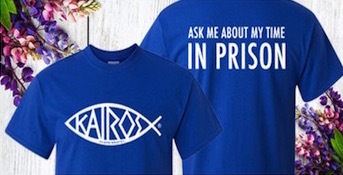 Make payable to "Kairos Prison Ministry."